A while back I posted a recipe for Eggplant, tomato, and smoked cheese pie. It is one of my favorite pies because it is truly a melody of flavors and you don’t even have to like eggplants to enjoy it. So when I was craving pizza but not really wanting to make any of my usual recipes I decided to make a pizza inspired by those flavors and so this recipe was born . I served this with an eggplant salad that resonates with the same flavors in the pizza and they complimented each other beautifully. To prepare topping, arrange eggplant on several layers of heavy-duty paper towels. Sprinkle eggplant with 1/2 teaspoon salt; let stand 15 minutes. Pat dry with paper towels; brush eggplant with oil. Arrange eggplant in a single layer on a baking sheet coated with cooking spray. Place them under the broiler till they are golden brown then take them out and flip them and brown the other side. Stack eggplant slices on a plate; cover with plastic wrap. Let eggplant stand 7 minutes to steam. Place a couple of tablespoons of olive oil in a pan over medium heat. Add garlic; cook 1 minute, stirring constantly. Remove from heat; stir in 1/4 teaspoon salt, basil, oregano, mint, and tomatoes. 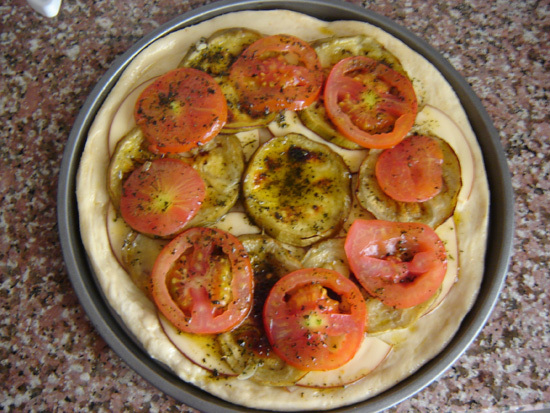 Layer eggplant and tomato mixture on the crust; drizzle with the oil you cooked the garlic in. Mix the dressing ingredients and set aside. Posted in Pizza and tagged eggplant pizza, eggplant salad, pizza, postaweek2011, salad dressing, smoked cheese. Bookmark the permalink. That looks wonderful and it uses some mint! Great recipe. I have a pizza fixation too. i should really stop with these food blogs…my table is like soaking in drool…lol yeah its that good! Oh my! I’m just about to pull your apple pizza out of my oven! I can’t wait to try it and let you know how good it is! 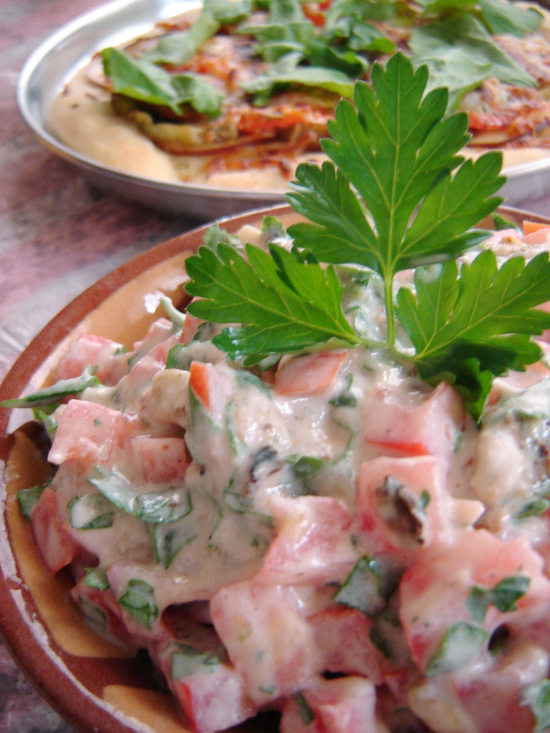 This sound really delicious, and looks divine!I love your photos too! Thanks for sharing and have a wonderful weekend! Oo la la… this looks reallllllyyy good! I can’t tell you how happy I am that you started your blog! I will be following every recipe with joy! 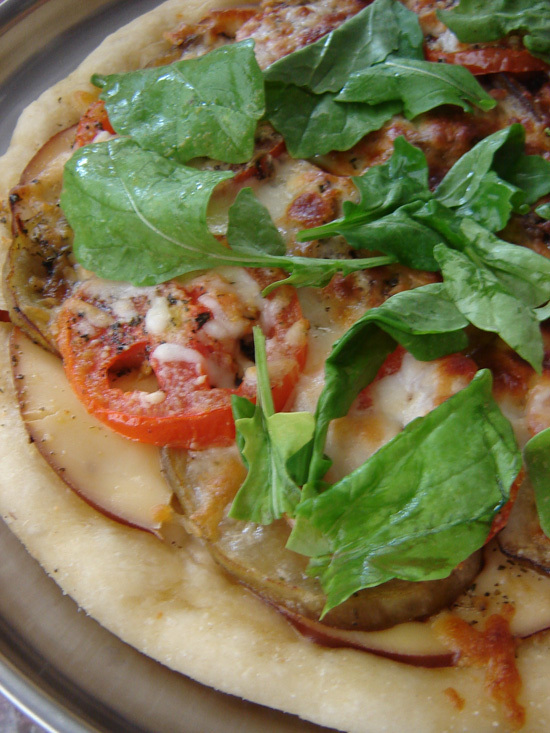 I love eggplant, well, and I love pizza, so this sounds absolutely fantastic! Looks great as well. I recently ate a pizza at a restaurant downtown that I have been dying to recreate, so hopefully I’ll be posting that soon! Hmmm! Last week I cooked eggplants two days in a row but not the two dish per meal. LOL. Both recipe looks very nice, but I’m more interested in pizza! It is a refreshing change from regular pizza..in color, flavor and preparation.. This sounds delish! My favourite pizza is roasted aubergine & smoked mozzarella, it’s been to long and now I’m drooling, not attractive!! i’d love to share this posting with the readers on my site. thanks for sharing! Very delicious for my lunch. Love it! !